This isn’t where you would expect to see Land Rover testing a rugged off-roader. We’ve already seen prototypes of the Land Rover Defender being put through their paces off-road, but these latest spy shots show the Defender in a more unusual location: the Nurburgring. Judging from the significant amount of body roll, the test driver is pushing the SUV to its absolute limits on the legendary race track. It’s unusual to see Land Rover testing the rugged Defender at the Green Hell, but the new model is designed to attract a broader customer base than before, meaning it will need to be just as capable on the road as well as the mud. Joe Eberhardt, chief executive of Jaguar Land Rover North America, recently explained how the new Defender will be better suited to everyday use compared to the old model. 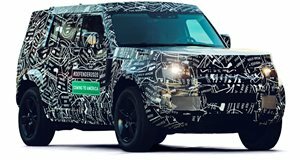 Unfortunately, there’s still a lot of camouflage covering the new Defender prototype, so design details are difficult to make out. The new Defender will retain the original model’s signature boxy shape and will be available in four-door 110 and two-door 90 flavors. Unlike the original, it will ride on a new aluminum monocoque platform instead of a body-on-frame platform, resulting in a lighter and stiffer body. Land Rover’s Modular Longitudinal Architecture will also allow the new Defender to accommodate different drivetrains including internal combustion engines, mild hybrid, and plug-in hybrid systems, and fully electric powertrains. Both body styles will use 2.0-liter turbocharged gasoline and diesel units in the entry-level versions, while upper-range models will feature 3.0-liter inline six-cylinder gasoline and diesel units with mild hybrid assistance. The new Land Rover Defender is expected to debut later this year, possibly at the 2019 Frankfurt Auto Show in September.